The Canon Powershot G9X camera is on the Canon USA eStore website, even before the official announcement has been made. The EOS-M10 and the Powershot G5X are both on the eStore as well. All three cameras' announcement should come very soon now. Impressive image quality. Stunning videos. A camera that’s slim and comfortable. The PowerShot G9 X camera is all this and more, featuring a 20.2 Megapixel*, 1.0-inch High-Sensitivity CMOS sensor, Canon’s powerful DIGIC 6 Image Processor and a fast, f/2.0–4.9 lens that helps you capture inspiring images – even in low light – with detail and color to match. Whether you carry it in your hand, a bag or inside a pocket, the PowerShot G9 X can accompany you anywhere you go and is slim enough to quickly be in your grasp when opportunity knocks. Subjects in the distance become closer with a 3x Optical Zoom lens (28–84mm equivalent). Movement can be captured in stunning Full HD video, or frozen in beautiful increments with up to 6.0 fps continuous shooting. Should you find yourself gazing at the stars, switch into Star Mode and admire the view. With a convenient control ring for quick adjustments on the fly, built-in Wi-Fi®** and NFC*** for simple sharing and its appealing portability, the PowerShot G9 X is ready when you are, where you are. At 1.0 inch, the image sensor on the PowerShot G9 X camera is larger than the ones on most other compact cameras. This allows it to capture a greater range of light, so bright areas of the image, like clouds on a sunny day, can be more detailed and less likely to be washed or blown out. With low-light scenes, like when you’re indoors or outside at night, an ISO range of 125–12800 lets you use fast shutter speeds to help keep photos sharp and virtually unaffected by camera shake. The 20.2 Megapixel* resolution is outstandingly high, giving you the option of printing out bigger photos or cropping in to highlight the best part. The PowerShot G9 X camera has an impressive zoom lens with a remarkable optical zoom range, helping you capture wide shots like a big party scene or a gorgeous canyon, or enabling you to zoom in and get a wonderful close-up. The fast aperture goes as low as f/2.0, meaning it’s possible to see the subject and take clear photos in low light, often without a flash. Combined with Intelligent IS image stabilization, it helps to ensure virtually shake-free images, even in dark rooms or outside at night. 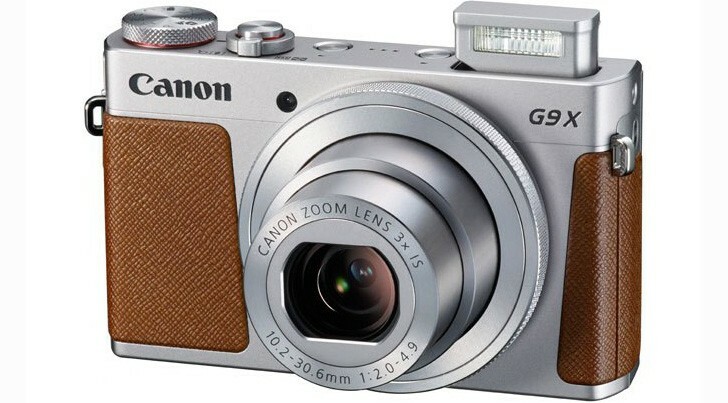 At only 7.37 ounces (209g), the PowerShot G9 X is a compact camera that’s not much bigger than a deck of cards, and can easily fit into a pocket or purse. Despite its size, it packs a large, high-quality image sensor and fast f/2.0 lens. These work together with features such as the DIGIC 6 processor to help create high quality photos, even in low light. This means you can have a camera within easy reach that’s able to deliver detailed images that show the texture of clothing fabric, the colors of a sunset or the moment a player kicks a ball at the goal. The 3.0-inch touch panel is designed to take advantage of both hands while holding the camera so you can make adjustments while still being ready to snap a photo. The menus are customizable, meaning the settings you adjust frequently are easily accessible. You’re also able to swipe quickly through photos you’ve taken, and tap the screen to easily adjust picture options and change what the camera is focusing on. In addition, the control ring around the lens can be rotated with your fingers to make adjustments to various settings, simplifying the process even further. Quick, simple adjustments are ideal when you’re trying to capture the great moments in life. The PowerShot G9 X camera uses a combination of a responsive, 3.0-inch touchscreen and a smoothly rotating control ring around the lens. Your right thumb can pick the setting you’d like to change, and then your left fingers can rotate the control ring to adjust it, all without lowering the camera or taking your finger off the shutter. For example, if you’re trying to capture a dog playing in the sun, you can quickly adjust the shutter speed with a tap of the menu and a twist of the control ring to get the amount of detail you desire, while keeping a bit of blur to show action.